Days number nine and ten of Philly Beer Week 2013 could not have been more different, yet equally pleasing. Saturday brought beautiful weather back and gave beer weekers no excuse not to be walking off their beers between events. I got the day started with some nice and easy beer from Great Lakes and Sly Fox at the FestivAle block party along Frankford Avenue outside Johnny Brenda's, Fette Sau, and Frankford Hall. Technically, I got it all started with some very nicely done sweet/spicy kebabs and an Evolution Rise Up coffee stout at TJ's prior to jumping aboard the city-bound train. Excellent start indeed. Remember when Johnny Brenda's was nearly the only reason (at least beer-wise) to jump off the Market-Frankford El at Girard Avenue? How things have changed now with their neighbors, Fette Sau and Frankford Hall, across the street at Barcade and Kraftwork, and Beddia's has opened up the pizzeria less than a block away to fill in yet another nook with great food and/or beverage option. The FestivAle was swell and all; I think I was there before the crowds and craziness truly descended. It was a relaxing session with the good folks from Origlio and Sly Fox at a picnic table to soak up the sun, an incredible brisket/pulled pork sandwich from Fette Sau, and beers from Sly Fox (Pikeland Pils) and Great Lakes (Rye of the Tiger IPA). Then, it was a slight diversion from the PBW track over to Penn Treaty Park where the Vendy Awards were being presented after an afternoon of tasting from food truck to food truck stationed around the park. The lines were too overwhelming for me to spend much more than an hour (after all, PBW events awaited back downtown), so I picked three that seemed like that they had the most movement happening. I couldn't have been more pleased in choosing Chez Yasmine (a Tunisian salad bursting with fresh flavor), King of Falafel (guess what I had? ), and Cow and The Curd (cheddar cheese and great dipping sauce accompaniments). Cow and The Curd owner Rob Mitchell and I traded pleasantries and shared similar stories from our experiences in Wisconsin. Brooklyn Brewery was supplying the Lager, Summer Ale, and East India Pale Ale. I later found out that King of Falafel and Cow and The Curd took home Vendy Awards, further gratifying my personal choices for this Philly Beer Week distraction at a lesser-known, but gem of a city park. Back across town on the El and I wind up next at Fergie's Pub hoping to catch the tail end of whatever was happening with the Father, the Rabbi, and the Priest. Sounded like a truly unique event with men of faith providing an atmosphere and discussion for introspection, higher being, and well, of course, beer. The event was technically over by the time I arrived, but still had the chance to talk with each of three, including Father Kirk Berlenbach. If the name sounds familiar, it may be because you recall the story from 2010 when this priest from Roxborough "saved Philly Beer Week" and the Opening Tap event. A very pleasant thirty minutes of my Philly Beer Week indeed. Then, it was off just mere blocks away on Sansom Street from Fergie's to Nodding Head, where I also missed the tail end of the Firestone Walker event which featured owner David Walker. That didn't stop me, however, from enjoying a couple always-out-of-this-world Pale 31s with Nodding Head owner Curt Decker, Wendy Domurat (Dogfish Head), Gordon Grubb (Nodding Head), Liz Einhorn (Boston Beer), Suzy Woods (Allagash), Chris LaPierre (Iron Hill), and numerous others who seemed to have descended upon one of the places that always seems to serve as a bit of an unofficial headquarters for those in the know during each Philly Beer Week. We took those good times a couple of blocks to the other side of Broad Street to the new Brü, which is an impressive space that runs between Chestnut Street and Drury Street. Can't believe it's taken all these years for another establishment to steak a bit of McGillin's secret on Drury. Ryan Niebuhr was on-site to rep Anderson Valley Brewing Company and speak a bit of their unique Boontling. An Oatmeal Porter from them was new to me and quite satisfying. There was that one last stop prior to finally hopping the train back out to the 'burbs and that last stop was City Tap House over by Penn's campus. David Walker had already moved on to here with the Origlio folks when I'd stopped by Nodding Head so the timing worked out nicely at CTH where we chatted for a while about everything under the sun including the recent Firestone Invitational, the excellent Central Coast festival which I promised I will get to in the very near future. A dinner, one more beer, and then a pleasant walk back to 30th Street Station put a wrap a pretty solid day nine of Philly Beer Week. Sunday. Maybe Saturday took a bit too much out of me. Maybe it was the yardwork that still needed to be finished before the next batch of drenching rain came through. It was a bit of both, more so the latter that gave us a few hours in the city before returning home. 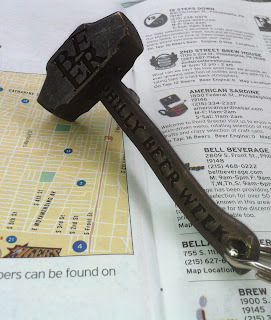 Hopefully, you've read this far, because here is where I make a plea for more beer/dog events during Philly Beer Week. Alla Spina hosted a doggie brunch and excecuted it quite well. It was a fundraiser for shelter dogs. There were special dog bowls created for our four-legged friends. There were specials on the menu and doggie bags of biscuits to go. See, if you're like me, your dogs get neglected a bit more than they should during Philly Beer Week. Coming. Going. Staying out late. Adjusting their dinner schedule. Their lives take a hit too. It would be great to see more dog events on the schedule. Not just dog friendly, but dog-centric, events. Let's see where that goes. I'll keep pushing and talking about it; you do the same as well and maybe we'll see yet another way to help make PBW more successful. That was it. A wrap. More went on. There was a TUD (totally unnecessary drink) at Fergie's. Earlier this year than in past years. I took care of the yardwork and had a few Sly Fox Grisettes. This beer is a near stone cold mortal lock on being named one of my "most memorbable beers" of 2013. I'll be back at some point, perhaps later this week, to put a bow on my "coverage" of Philly Beer Week 2013.